Get ready to slurp up the first-rate noodles at this Penn Quarter shop. 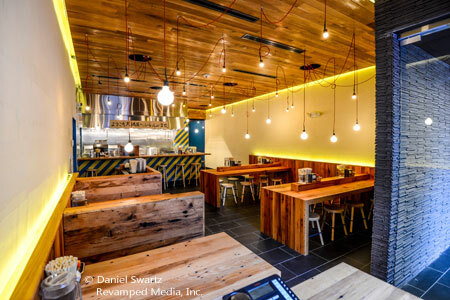 : Previously cooking at such restaurants as the now-closed Café Atlántico, Katsuya Fukushima joined forces with several others to launch Daikaya, which has an upscale ramen bar downstairs and an izakaya lounge upstairs. It’s no wonder that lines start forming out the door --- at least for the ramen shop --- during much of the day and on into the evening. Fortunately, seating is communal and/or random, so you can grab a place pretty quickly if you are on your own. Fukushima has gone to extra measures to make this noodle meal distinctive: the noodles are handcrafted and imported from Japan. The menu features different versions of ramen, starting with the shio ramen in a delicate broth followed by dark soy sauce shoyu ramen, mugi-miso ramen and spicy miso ramen. These are topped with meat, and another choice is vegetarian. Desserts may include black sesame panna cotta while beverage options range from saké and beer to wine and cocktails (plus “mocktails”).